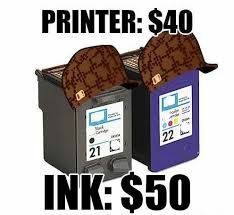 We regularly get asked tips on how to save toner whilst printing, because as we all know, toner cartridges can be pretty expensive. Regularly replacing your toner cartridge can massively bump up the overall cost of printing, so it's important to try and save money where possible without ever comprimising the quality of our printing jobs. Here are our top tips for saving toner whilst still printing everything you need! 1. Where possible, when shopping for your printer try and research which printer has the best value for money and cost per page. Occasionally you'll think you're purchasing a cheap laser printer but the cost per page far outweighs the low initial price. Quality over price will always help your printing costs in the long run! 2. Get a printer which allows you to print double-sided. An automatic duplexer will allow you to print copy on both sides of the page - massively saving your printing costs. You'll also be far more economical by printing this way. Doing your bit for the environment is always a plus, right? 3. Some printers will have an ink-saving or toner-saving mode. If you can select this in the settings of your printer then do - it will really try and get the most out of your cartridge. 4. Be sceptical of low-cartridge warnings. Printer manufacturers can afford to reduce the cost of their laser printers by charging a lot for toner cartridges, ensuring repeat purchases. They want your money as often as possible so always be sceptical when you get a warning message - you've probably got a few more prints before you need to replace it! 5. Take care of your toner and ink. Run regular cleaning cycles of your printing nozzles and print test pages to ensure everything is working properly. Ensuring no build up of debris or ink/toner blockages are effecting your print will improve the ink/toner flow, meaning you get more out of your cartridges. 6. Perhaps most importantly of all - don't shy away from alternative toner cartridges. Branded toner cartridges can cost you a fortune, but here at City Ink Express we stock an enormous range of high-quality, alternative cheap toner cartridges which will keep your printer working in tip top condition! At City Ink Express, we are always thinking of new ways to simplify the way our customers interact with our wesbite. Take our 'Quick Search' as an example of this; we have recently made this feature more prominent on the page, to help ensure compatible toner cartridges are more accessible to you. Using our 'Quick Search' bar you simply type in the details of your particular printer model, and we'll show you a list of all the available toner cartridges to fit your device - and as this is City Ink Express remember, we stock both original and compatible cartridge options, making your selection is vast! Using our Quick Search bar is the fastest way to purchase toner - so you can add speed to great pricing, high-quality, and excellent service for reasons to make City Ink Express your only toner vendor. Choose your manufacturer here to access this awesome tool. If you are looking for black toner cartridges, you're in luck! We pride ourselves on being the most comprehensive, well-priced, and customer service-focused toner vendor online. For a start, you can search via your device model itself, which ensures any cartridge you purchase will always be compatible. You can also trust that whatever cartridge you purchase from us is of an exceptional quality - we test all of our toner to ISO standards. Pleasingly, you'll also find our prices to be extremely reasonable, and the most competitively priced around! Even after you make your purchase with us, you can also benefit from our wealth of printing knowledge and expertise - this is accessible through a number of different communication methods and social media platforms. As we're pretty much experts in the field of HP toner cartridges, it is fair to say we've had our fair share of dealings with the HP LaserJet 5 series. As such, we thought we'd write a brief summary of this popular line to let you know the score. The HP LaserJet 5 series was introduced in the middle of the 1990s as part of Hewlett Packard's existing LaserJet range. The LaserJet 5 series can unofficially support up to 32MB 72pin SIMM modules with parity, which lets you install up to 98MB of memory. Being a range of monochrome printers, the 5 series will only allow you to print in black - making them ideal additions to offices, or anywhere that requires quality documents in black print. As far as the network connection is concerned, though the 5 series does not come with a network adaptor, there is an expansion slot and the firmware itself supports all network printing. A little tip for you: if you are struggling to install a network card, you can reset your printer back to its factory settings, then let the printer fully boot before releasing the online button. You should now be able to get the network configuration to work just fine. All-in-all the HP LaserJet 5 series is a high-quality laser printer which will be most at home in office environments. To give you an idea of the kind of savings you could be making with City Ink Express, we thought we would share with you our HP toner cartridges price list. You will find both examples of original and compatible options on our HP toner cartridges price list, so you can choose whether you wish to have toner made by HP themselves, or a third-party manufacturer. Though we’ll give you some examples from our HP toner cartridges price list, if you go to our HP toner page itself you will find a complete list of devices listed by their model number. All you must do then is select your model to be directed to a list of toner cartridges that are compatible with your particular printer.